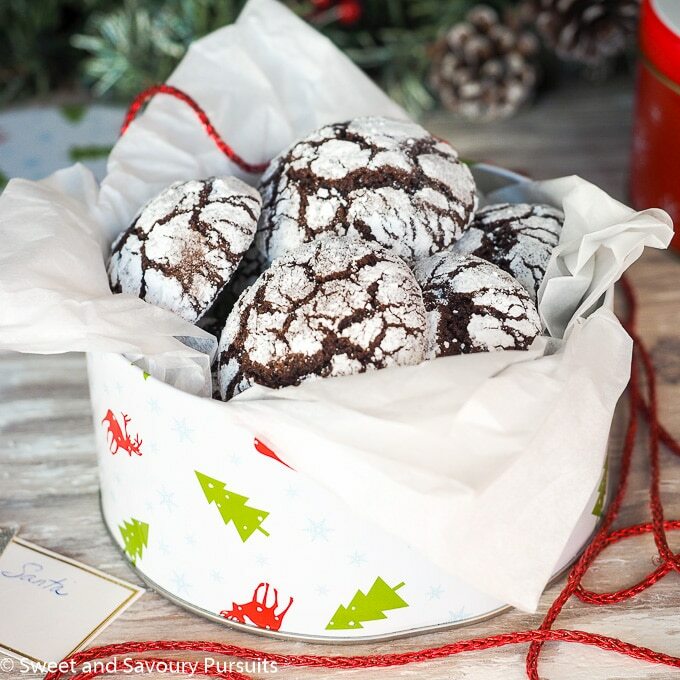 These Holiday Chocolate Crinkle Cookies are the perfect holiday cookie and are a must on your holiday dessert tray. 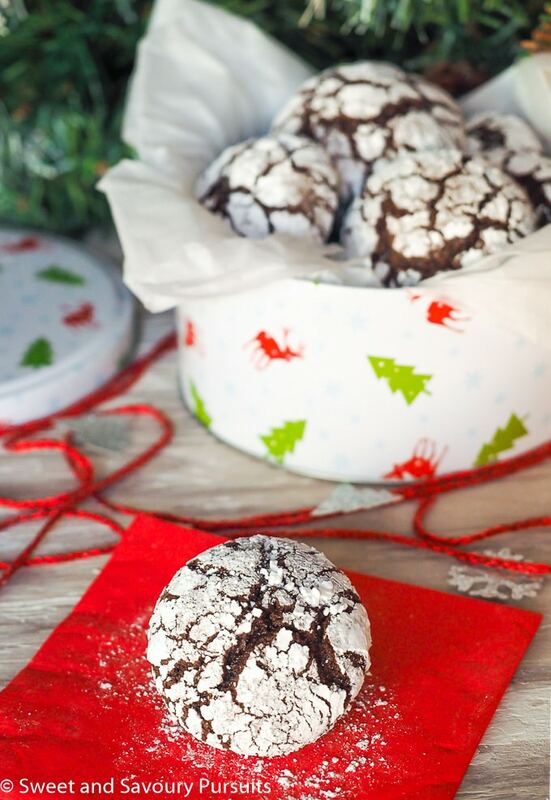 If you are a serious chocolate lover and are still looking for cookie recipes for the holidays, I highly recommend these Holiday Chocolate Crinkle Cookies. They are delicious, easy to make, look pretty, and you probably have all the ingredients already on hand. The important thing to take into consideration when making these cookies is that they require some chilling time before you can roll them into balls and bake them. If you are a planner, then you’re one step ahead, prepare the batter the night before, refrigerate and roll and bake the next day. If you’re more of a what shall I bake today person, no worries you can still make these. All I did was cover the batter with cling film and put it in the freezer for about an hour and a half. The batter was chilled enough to roll and the cookies baked up beautifully with perfectly shaped domes and a beautiful dark and white crackly look. These cookies can be made up to three months ahead of time and frozen to enjoy later on. Layer the cookies in an airtight container with wax paper between the layers of cookies and freeze. I adapted this recipe from Cook’s Illustrated, you can find the original recipe here. 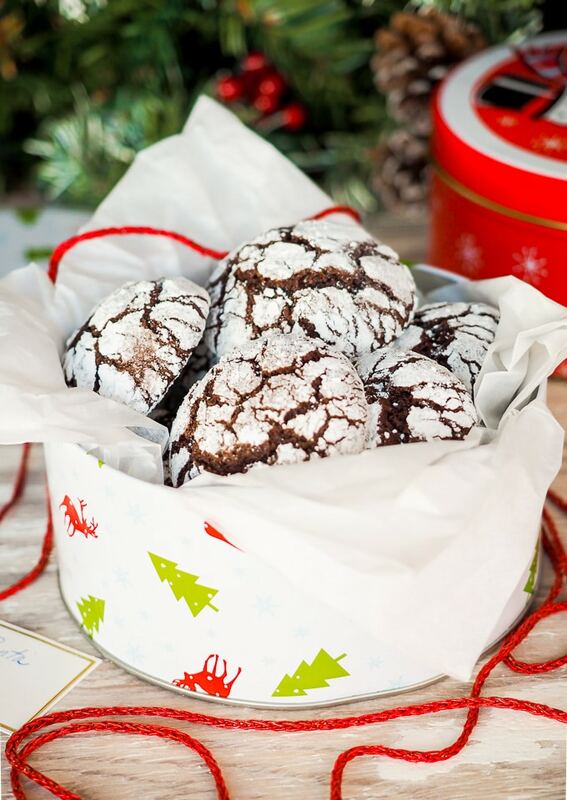 I don’t know about you, but I think a chocolate crinkle cookie is a must on my holiday cookie tray. Enjoy! Cover the bowl with cling film and refrigerate for 4 hours or more. If pressed for time, place covered bowl in the freezer and freeze for approximately an hour and a half. 1. If dough sticks to your hands when rolling, just powder your hands with the icing sugar, the dough shouldn't stick anymore. 3. At 10 minutes you should have cookies that are still very fudgy inside. If you prefer them more done, leave them in the oven for an extra minute. I found that the cookies I left in for 12 minutes kept a perfectly domed shaped. Those at 10 min sunk in just slightly in the middle. They look so good! I will try to make this for the holiday. How do you store these cookies and for how long? Thank you! Thanks! These are a favourite during the holidays and I’ve made them ahead of time before and froze them for a good 3 weeks before serving them. Make sure you store them in the freezer in an airtight container. Thaw and serve at room temperature. Enjoy! I made these for Christmas and added peppermint extract…seriously the Best. Cookie. Ever. Thanks so much!! That’s wonderful, I also made these cookies again this year. I love your idea of adding peppermint extract, I’ll have to try it next year! These look simply delicious and so beautifully photographed! i saw you on FB and just had to come say hi to a fellow Canadian. Merry Christmas! Thank you so much 🙂 Merry Christmas to you Robyn! These just scream, the holidays! And I can never pass up a cookie that combines chocolate and espresso! I agree, chocolate and espresso are a match made in heaven! These are such fun cookies, so perfect for this time of year. Thanks, Fida! Thanks Louise, I think powdered sugar cookies are a must for the holiday season! Thanks Nancy, they’re delicious, even my kids think so! yumm love the espresso! very tasty and beautiful! Thank you Lynz. I think espresso does such a great job of enhancing the flavour of chocolate. I can imagine, that would be so good! They look great, do you use light or dark brown sugar? Thanks! I used light brown sugar. I’ll add that to the recipe.